Aimone Art Services is dedicated to furnishing you-- the working artist, aspiring artist, arts professional, or art appreciator -- with a variety of services designed to expand and enhance your fine arts awareness and ability. Its primary offerings are art workshops and retreats focusing on nonobjective painting and drawing, and on the art-making process. These intensive short courses are designed to furnish artists with experiences to enhance their expressive ability and visual acuity. The approach is exploratory and dedicated to addressing each artist-participant in a very personal and highly nurturing manner. These workshops, taught by Steven Aimone, have been offered for more than a decade and conducted throughout North America. Katherine Aimone serves as the Managing Director of Aimone Art Services, from the overall conception of workshops, booking of venues, and general day-to-day management of the business. Aimone Art Services also furnishes fine arts writing and publishing services through its subsidiary, ArtsWrite (founded by Katherine Duncan Aimone in 2011). Katherine specializes in in-depth interpretive essays written for exhibition catalogues, books, and other print materials for artists. She has been doing this work in various forms for over 30 years as a curator, journalist, and writer. Born and raised in northern New Jersey, Steven Aimone spent his formative years as an artist in New York City, immersing himself in the offerings of galleries and museums. While there, he attended graduate school at Brooklyn College where he received an MFA in painting and drawing. In 1993, Aimone left NYC and journeyed to Florida where he served as Visiting Artist in painting, drawing, and design at Stetson University. He subsequently served as Artistic Director of Arts on Douglas (commercial gallery in New Smyrna Beach) and helped found ProArt Institute, a non-profit arts organization offering fine arts courses to working artists. In 2000, Aimone married artist and fine arts writer-curator Katherine Duncan (Aimone) and in 2002 the couple formed Aimone Art Services, offering fine arts workshops and arts writing services. Through AAS, Steven has taught workshops to a wide range of audiences in venues throughout North America. His most recent book, Expressive Drawing: A Practical Guide to Freeing the Artist Within, was published in 2009. Aimone's art works have been the subject of numerous solo and group exhibitions in New York and elsewhere on the east coast, and are represented in more than a dozen corporate and numerous private collections. Katherine Aimone earned her MA in art history from Florida State University in the early 1980s and began a career in museum work, serving as Curator at the DeLand Museum of Art (now the Museum of Florida Art), where she attracted high-profile artists such as Faith Ringgold and Miriam Schapiro. Later, as the Curator of Exhibitions and Collections at the Polk Museum of Art in Lakeland, Florida from 1988 to early 1991, she worked on the exhibitions for the new museum building, including solo exhibition of the work of James Rosenquist. Her professional trek then took her to Hot Springs, Arkansas, where she served as Director of the Hot Springs Arts Center. In 1993, she returned to North Carolina for the position of Curator of Exhibitions at the Folk Art Center on the Blue Ridge Parkway. She created and managed changing exhibitions, attended to the permanent collection, and produced publications for exhibitions, working with artists such as Harvey Littleton, the “father” of the studio glass movement. In 1997, she moved to Florida to serve as the interim director of The DeLand Museum (now the Museum of Florida Art) prior to being contacted by Lark Books/Sterling Publishing (NY) to serve as one of their editors. She returned to Asheville in 1998. 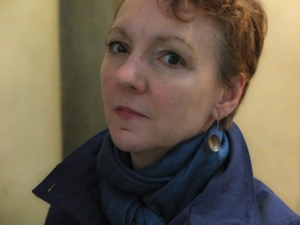 Due to her work as an editor and writer for Lark Books, her name is on the cover of many books, including The Fiberarts Book of Wearable Art (2004), a collection of 40 essays by Aimone about various artists. Over the years, she has also written essays for numerous exhibition catalogues as well as arts-related articles for newspapers and magazines. In 2003, she curated a retrospective of the work of artist Tim Murray, Changing Perspectives, at Brevard College in Brevard, North Carolina and wrote the essay for the exhibition catalogue which covers the artist’s career. In 2007, she was asked to write the catalogue essay for Black/White/Red All Over, an exhibition of the tapesty work of Micala Sidore shown at The New Hampshire Institute of Art. In 2011, after forming ArtsWrite, photographer Lee Dunkel requested her assistance with a book about her work, and she completed an essay on 25 years of Lee’s work and served as editor the book. In 2012, she wrote and produced a catalogue on the work of abstract painter Beau Wild, and most recently, she has written an essay on the mosaic work of Jacqueline Iskander. The Aimones now live and work in Rockland and Monhegan Island, Maine, in the summer, and Asheville, North Carolina during the winter. Both are painters and writers.